FurPlanet is a publishing company owned by FuzzWolf and Teiran which was founded by and for the furry fandom. 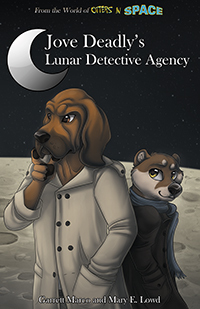 We publish and distribute furry-themed comic books, magazines, comics, art CDs, music CDs, art prints, portfolios, custom art card decks and more. You can also find us at many major furry conventions in the United States. Just look for the FurPlanet Productions table when you go to a convention. 2. How long will it take my order to arrive? While we strive to have most orders shipped within two weeks of receiving them, sometimes it can take a little longer if it is close to or shortly after convention we are attending. Even then, most orders will be shipped out within two weeks of being placed. For Domestic US orders, if the order has been shipped and has not been received within two weeks of the ship date, please contact us. International orders may require additional time to be received. Your order status will be updated from New to Shipped once the order has been shipped out. Yes, we ship worldwide. Most countries are available from the dropdown menu of the Shipping Address screen when you are placing an order. Shipping cost varies by location and item(s) so just enter the items you are interested in to the shopping cart and go through the check-out process, enter your shipping address and the next screen will give you the shipping cost which will be charged if you complete your order. 5. How are your orders packaged? All of our orders are shipped in plain envelopes or boxes. International orders will ship with a customs form identifying the product type only, e.g., book, comic, etc. 6. Can I pay for purchases with Paypal? At the time of writing this, Paypal's current policy regarding adult material is that it can only be purchased with Paypal if the customer is in the continental United States and if it is a physical product. This effectively bars the sale of our adult orientated products to anyone living outside the US. Given that Paypal may choose to change their user agreement at any time and that our current store software cannot specify by item and location what payment methods can or cannot be used, we have decided not to activate the Paypal payment option on our store. A workaround for this problem if you must use your Paypal account to make a purchase is to apply for a Paypal debit card. It carries a Visa or Mastercard logo and has a standard 16-digit account number so it can be used anywhere you would normally use a credit or debit card. We would like to offer Paypal as a payment option on our site, but we cannot. We apologize for the inconvenience. 7. How much will it cost to have my book printed? We are actually a publisher, not a printer. Some of the advantages to working with a publisher rather than having the book printed yourself are that we attend many conventions in addition to selling online so we bring your books directly to their intended audience. We assign each book we publish an ISBN with barcode so you will be on record as an actual published author. We also have distribution arrangements with other retailers which allows your work to be sold to an even wider audience. If you wish to have your comic or book published by us, you do not have to pay anything to do so. Just follow the guidelines on the Submission Guide and we can discuss having your material published if it meets our quality and content standards upon review. 8. Will you sell my self-published novel, comic, etc? Unfortunately our staff does not have the time available to read and evaluate self-published work to determine if it meets the quality and content standards we maintain for our own publications. Products we sell which we do not publish are those which have been published by trusted companies which we have distribution arrangements with. 9. Who drew your banner art? We will be continually working on this FAQ and will be adding more questions and answers as time goes by. For now, if you have any questions please click the Contact Us link on the menu under the banner. If you have any questions regarding submission info, please click the Submission Guide link on the menu.